Wednesday: 11.00 a.m. - 18.00 p.m.
Peterhof, the UNESCO site, is one of the most attractive summer residences of the Romanovs in the vicinity of St. Petersburg. Moreover, visit there can be one of the best St. Petersburg tours, especially when it is accompanied by one of our expert guides. It takes about an hour drive to reach Peterhof (Peter’s Yard) ensemble of palaces and parks, located in the town of Petrodvorets (Peter’s Palace in English) on the cost of the Gulf of Finland. The complex consists of the Grand palace, about 20 museums total including small palaces on the grounds of Peterhof residence, and the famous Upper Garden and Lower Park with incredible fountains, which brought the proud nickname to the place: Peterhof, Russian Versailles. The Upper Gardens cover over 15 hectares (~37 acres) and are the front yard leading up to the Grand Palace. It is important to note that the fountains you will find in the Lower Gardens do not use pumps, the fountains are at a lower elevation than the ponds so the pressure is enough to power the fountains, including the Grand Cascade. The exception is the Samson fountain, which requires a 4 km aqueduct to create enough pressure. 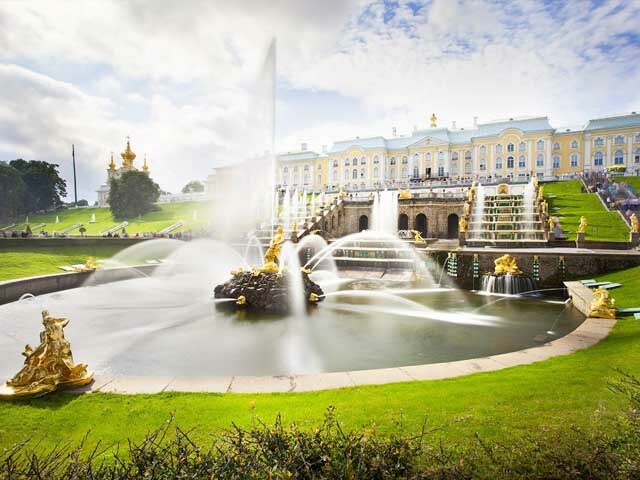 The Lower Gardens contain most of the more prominent fountains and are featured in a lot of the pictures you will see if you do a search for Peterhof. The Lower Gardens span an area of 102 hectares (~252 acres) and are split in half by the canal into the eastern and western sections. The Lower Gardens were designed in French style and showcase the talents of Peter I, his sense of style, and his sense of humor. In the Lower Gardens there is another ‘Hermitage’, certainly not to be confused with its more famous counterpart, it is a small pavilion surrounded by a moat and containing 124 paintings from different European artists. 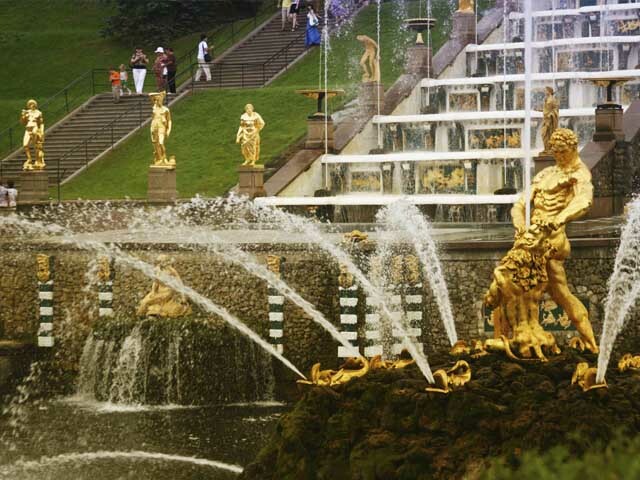 The Samson fountain is the center of the Grand Cascade and is the highest fountain in Peterhof. A special 4 km reservoir allows the fountain to shoot 20 meters into the air, easily grabbing the attention of all visitors to Peterhof. The original statue was stolen by the Germans during the war but was reproduced from photos by Vasily Simonov and on display again in 1947. The Chess board Hill Cascade, boasting three dragons from which water spouts down a chequered chute flanked by statues of Greek and Roman deities. This cascade is one of the main attractions of the eastern section of the Lower Gardens. It contains a small grotto which is the oldest part along with a 4 tiered cascade which is surrounded by statues. The chessboard design was added in the mid-18th century. The Golden Hill Cascade, a flight of waterfalls issuing from gilded orifices and really too many more fountains to mention here. This cascade is near Marly Palace. It has a statue of Neptune at the top and along the sides are various other Greek mythical figures such as Neptune, Triton, Nymph, Andromeda, Venus, and Cupid. 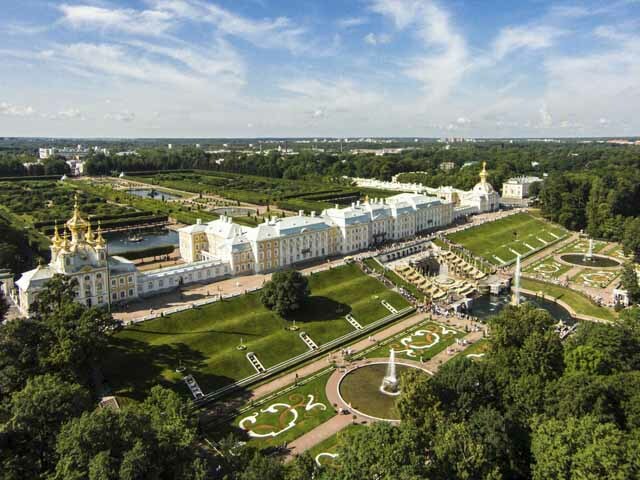 The tour of Peterhof is not just a visit to the beautiful palaces and gardens of the Northern Versailles. This is the tour, which will bring you back to the 18th century and show you the summer life of Royalty, its traditions and styles. 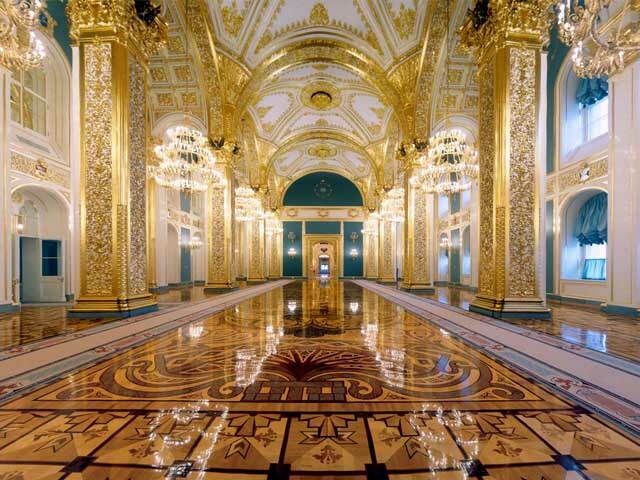 You will be the private guest of the Russian Emperor and find out all the secrets of the court. Without Peterhof you haven’t been to St. Petersburg, that’s what the locals say. Join our Peterhof tour and you will never forget your wonderful trip there!